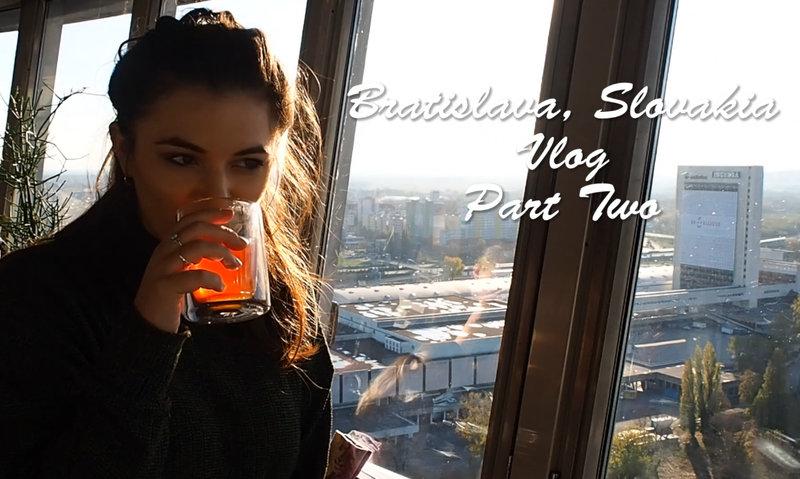 As you have most likely guessed form the title of this post, this is the second instalment of my vlog of my trip away to Bratislava. In this video I take you along with me for the third and final day of our long weekend away in Slovakia. The weather was a little brighter and warmer on the Sunday and so we enjoyed walking around and getting more of a feel for the city. We went back to the old town and had brunch in a lovely book-shop café, before walking up to the new WW2 monument. We then walk back down and over the bridge, across the Danube and saw some amazing views. We then headed up the UFO tower which is the smallest of the 50 Great Towers of The World. It was an observation deck and because of the weather we were able to view the whole of Bratislava which was incredible. Our last day was a bit of a funny one. We took our time getting ready and packing our bags and then walked to a beautiful little café for some lunch and coffee. We then had a last little look around before getting a taxi to the airport. We both had a lovely time away and I would highly recommend Bratislava as a destination for a long weekend away. I hope you’ve enjoyed watching this vlog, you can also see Part One if you missed it. There will be a couple more travel based posts coming soon about my trip with a bit more of an insight as to what we got up to and what I would recommend visiting. Where would you recommend going for a long weekend away?